On June 18, I posted about my excitement at the chance to attend the Theatre on the Hoof Wild West Show, The Medicine Line. I went without any expectations other than a camera full of photos, and overall, I enjoyed what I saw. Since the set needed a teepee, we had a chance to see an authentic one put up. In the following photo, the stage is the area immediately in front of the benches. It includes the teepee on the right, to the fire pit on the left. I have to admit that the allowing of vehicles, crew, and audience members in the background detracted from the authenticity, but it didn't spoil my enthusiasm. And although the addition of headset microphones and stage left and right speakers didn't fit with the 1877 setting, I will be the first to stand in line and say I appreciated being able to clearly hear everything that was said. The sound on my videos aren't as clear, however, because my camera mic couldn't escape the prairie wind. 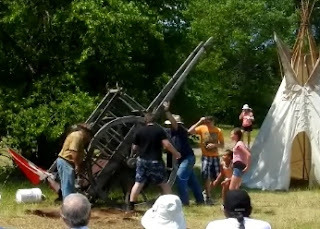 The Red River Cart demonstration was a welcome suprise since I've included one in a couple of my stories. I knew the carts were made of wood and wet rawhide strips called shaganappi, and without nails or metal fasteners. 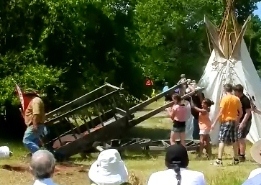 What I didn't know, though, was that the Red River Cart could be dissassembled within minutes, even with the help of children. Taken apart, the Red River Cart can be placed on top of the flat wheels and used as a raft. Ingenious. However, the lack of grease caused the wooden parts to rub together letting out a horrid screech which could be heard for miles across the prairies. July 1st is Canada Day, the day Canadians celebrate the creation of the 1867 British North America Act which stated that Canada would become a dominion (a territory) independent of England. It wasn't known as Canada Day back then, but rather Dominion Day. 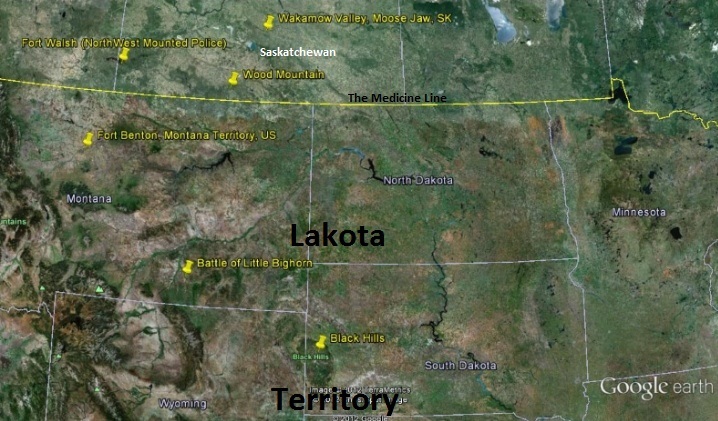 The Medicine Line takes place beginning in 1877when Canada was 10 yrs old and the current prairie provinces of Alberta, Saskatchewan and Manitoba were only territories of the Dominion of Canada. In 1876, Lt. Colonel George Custer and the Seventh Cavalry were sent out to force Sioux and Cheyenne Indians back to their reservations. Led by Sitting Bull, the Indians were victorious in what is known as, 'Custer's Last Stand'. But having won the Battle of the Little Bighorn, the Indians were now enemies of the U.S. government and therefore on the run. And so begins The Medicine Line show. It's a year later and Sitting Bull has taken his band of 5,000 Lakota Sioux to their traditional winter hunting grounds in the Wakamow Valley of Moose Jaw, Canada. Except this time, Sitting Bull has declared his intention of not going back to the U.S. Enter Major Walsh in charge of the NorthWest Mounted Police at Fort Walsh. He welcomes Sitting Bull and lays down the law - the visitors can stay as long as they obey the laws. The show continues through the few years until finally, Sitting Bull returns to the U.S. It wasn't by choice, but the extra 5,000 Sioux he had brought to Canada helped deplete the buffalo reserves across the prairies until it wasn't only his people that were starving, but the Canadian Indians as well. Even so, a small band of 80-100 Lakota Sioux remained in Canada near the Wakamow Valley of Moose Jaw and other places in Southern Saskatchewan. As I mentioned earlier, this production was fun and informal. It attempted to present history in a live format for entertainment as well as education. I'd like to send a big thank you to Ken Mitchell and his crew for taking on this project with limited funding and for having the vision to turn it into something meaningful. If you'd like more information on The Medicine Line, cowboy poetry, and future shows, please visit www.burningsun.ca. Do you want to see an outtake from the show? As everyone knows, live shows have their share of problems and this one was a horse who didn't feel like going where he was supposed to go. Do you watch the outtakes of movies and TV shows? Do you think showing them detracts from the seriousness of the show? I love Native American culture. 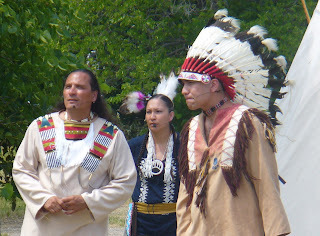 We have a Native American festival every year nearby in Chesapeake, and there are also Native American reenactments at an event called History Alive that we took the kids to when we homeschooled. That cart is awesome! What a cool idea! Colorado became a state in 1876. Interesting to see the correlation with things going on in Canada and elsewhere. I agree, Dina. I especially like productions that use Native Americans - or First Nations as we call them in Canada - in the plays and movies. I remember the old western movies when you'd have a battle and the Chief was clearly the Caucasian from last week's movie. Traditionally, you can always tell a Metis because of the coloured sash they wear around their waist. As for the difference between our countries, I like to show what's going on both sides of the border in my stories too, because the US played such an important role in the settlement of Canada's prairie provinces. For example, there were probably a hundred Metis driving bull trains of supplies from St Paul, MN up to Winnipeg, MB at any given time, and I've gone to the Minnesota Historical Society website many times for information about them. Anita Mae, I love your history posts. Thanks for educating us about what was going on in Canada as well as the US. Alrighty... just fixed the post so that the bottom video is actually the one about the stubborn horse. Sorry about that. Great post! I love historical re-enactments. I'd forgotten about the Lakota Sioux staying in Canada, but I didn't know what happened after that. I always learn from your posts! And yes, I love outtakes and bloopers in movies, etc. They're sometimes the most memorable parts! I really do have to check into doing something about my camera mic's reception since the wind is an everpresent feature of the prairies. I hope you caught the post after I put the outtake video up. I had it up earlier this morning, but then it got lost in the shuffle when I added the other video. I think they're both there now. I loved learning the CDN part of the Sioux history, too. I used to go to school with a girl descended from Sioux. I learned a lot from her, and she had beautiful black hair! The first outtakes that I ever saw were from Ferris Beuller. Those were hysterical, but unless the movie is a comedy I don't watch for them. If I was watching Meg Ryan and Tom Hanks in You've Got Mail, my cozy happy feeling would disintegrate with outtakes. I love historical reenactments --oh yes! Great info on an interesting subject and I expect to see that rich history in your future stories! As for outtakes... I agree they are much better for comedies. I swear I saw outtakes from Passion of the Christ. Mel Gibson is a known practical joker but also has the ability to switch back to seriousness acting. Hard on everyone else who doesn't! 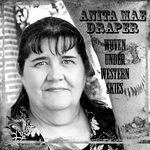 Enjoyed the videos Anita Mae. Suzie, good point about the outtakes. I guess it does put a different view of their relationship. Thanks for mentioning it. I don't think I could watch outtakes of the Passion of the Christ. That would seem almost sacriligous (sp?). I really enjoy outtakes for comedy movies, but I also watch the drama ones. I especially like the scifi ones where the techno stuff doesn't work. Really glad you enjoyed the videos. i love your historical posts, i always learn sokmething cool. i enjoy outakes from comedies and sci-fi films. my favorites are from the Pixar films since in animation outtakes don't really exist. it perpetuates the idea that the characters in the film are real actors. as for your camera mic. it is an omni-directional mic, so it's going to pic up everything. if you get a directional mic - you can probably lose the wind except when it lines up with the mic. the drawback is you may lose other audio (like your behind the camera commentary). thanks for the history lesson! and a view of a cool historical re-enactment. Hey there DebH, I haven't seen one of the Pixar outtakes yet. I'll have to keep an eye out for them as that would be something special. Ha. About the mic - I think my camera has both because I can change it to a wind reduced mic, and although I don't get as much wind, I lose a lot of other sounds. It's something to keep in mind, though. Thanks. It sure is nice seeing you here since we haven't emailed in weeks. I'll get on it soon, though.